This article is about for the band. For for the rapper, see Sleep (rapper). Sleep live in March 2018. Left to Right: Al Cisneros, Jason Roeder, and Matt Pike. Sleep is an American doom metal power trio from San Jose, California. The band earned critical and record label attention early in its career. Critic Eduardo Rivadavia describes them as "perhaps the ultimate stoner rock band" and notes they exerted a strong influence on heavy metal in the 1990s. However, conflict with its record company contributed to Sleep's breakup by the end of the decade. The band reformed in 2009 and has played sporadic live dates internationally since. 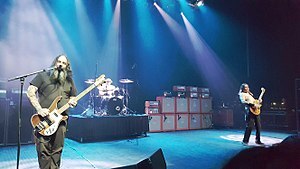 In 2018, Sleep released their comeback album, The Sciences, on Third Man Records, to critical acclaim. Sleep evolved in the early 1990s from the band Asbestosdeath, which was established by vocalist/bassist Al Cisneros, drummer Chris Hakius, and guitarist Tom Choi. Asbestosdeath expanded to a quartet with the introduction of Matt Pike on guitar, and recorded two singles - "Dejection" for Profane Existence and the self-released "Unclean". Choi departed, and would later found Operator Generator, It Is I, Noothgrush, and Las Vegas' Black Jetts. Asbestosdeath recruited Justin Marler as replacement and the band adopted the new name, Sleep. Their debut album Volume One was released in 1991. Frequently compared to bands like Saint Vitus, Sleep soon gained a devoted fanbase within the developing doom metal scene. Marler quit the band soon after to take up life as a monk, leaving the band as a power trio for the recording of their Volume Two EP, which was released officially by Off The Disk Records in 1991. The band's next album was sent to the independent label, Earache, as a demo. Recorded at Razors Edge studios in San Francisco, with Billy Anderson as engineer, the tape showcased Sleep's love of all things retro, from the blatant Black Sabbath/Blue Cheer influences, to their fixation with 1970's-style tube amplification. The label immediately signed the band and released the tape exactly as it was received. Under their new contract, Sleep began work on their third album, Dopesmoker, in 1995. Much to the dismay of executives at London Records, Dopesmoker was a single song, over an hour long. London Records declared the album unmarketable and refused to release it. They had it remixed, cut up into sections by David Sardy, which led to a deadlock with the band, Sleep being very unhappy with the result. Frustrated and generally unhappy with the situation, the members of Sleep decided to disband. In 1998, Sleep released Jerusalem as an "official bootleg". One year later, Jerusalem was given an official legitimate release by The Music Cartel in the US and Rise Above Records in Europe. 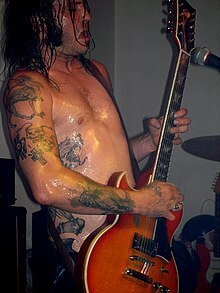 Matt Pike is also the frontman of the band High on Fire. Cisneros and Hakius later formed the doom metal band Om while Pike formed sludge metal band High on Fire. In 2007 a CD compilation of both 7-inch releases of the pre-Sleep band Asbestosdeath was released on Southern Lord Records. In May 2009, Sleep reformed to perform two exclusive reunion sets in Britain as part of the All Tomorrow's Parties music festival. In the shows the band performed for the first time an unheard song that had been written during the Dopesmoker recording sessions, which was titled "Antarcticans Thawed." After the band’s initial reunion performance, original drummer Chris Hakius decided to retire from music to raise a family, and he was replaced on drums by Jason Roeder of experimental metal band Neurosis. The reconfigured lineup played the ATP New York 2010 music festival in Monticello, New York, where it performed Holy Mountain in its entirety. The band followed up this performance with a tour of the rest of the United States, playing headlining dates and festivals, through September. From 2010 onward, Sleep performed similar sporadic festival and touring engagements when the member's otherwise busy touring schedules permitted. In late 2012, in conjunction with an upcoming appearance at Maryland Deathfest, the band stated that it considers Sleep to be a "full, reunited band." In 2014 Al Cisneros announced in an interview that the band was working on a new record. On July 21, 2014, a new song titled "The Clarity" by Sleep was released via Adult Swim Singles. In November 2017 the band members posted a message in Morse code stating that they had almost finished recording material for a new album. On April 19, 2018, the band announced The Sciences, their first album in nearly 20 years, to be released the next day on Third Man Records. The release of The Sciences was a surprise, being released the day after it was announced, and created a lot of excitement within their fanbase. The album's release date, April 20, 2018, was also Record Store Day weekend. Third Man Records released a limited edition split-colored vinyl with an alternate cover to be sold at a limited number of record stores in the US on the release date. The album was met with critical acclaim. Pitchfork wrote in their review, "[The Sciences] makes everything that was originally great about Sleep even better." Spin declared that the record gives "stoner-metal acolytes a bonafide miracle." On May 23, 2018, Sleep released a new song titled "Leagues Beneath" through Adult Swim Singles and Third Man Records. Musically, Sleep's sound has been characterized as stoner rock built upon slow, down-tuned bass playing alongside similarly low guitar riffs. Repetition is frequently employed, working to create a "hypnotic state" supplemented by Al Cisneros' vocals. Sleep has used cannabis-influenced imagery since the release of their second album, often delivered in a "quasi-religious" manner. In an interview about the making of Dopesmoker, Matt Pike acknowledged that the band spent "a lot" of their label advance on cannabis, and "a lot of time." Pike also said that about $75,000 was spent on customized amplifiers so the album would have numerous tone layers. Matt Pike said the songwriting process for Dopesmoker was long, with the band "working on [the song] for like four years." Al Cisneros stated that smoking cannabis was vital to the song's creative process: "I was really dependent on the space I got into when I was using it [...] The line, 'Drop out of life [with bong in hand],' was kind of a creed at that point." Their record The Sciences makes multiple allusions to Black Sabbath, whose sound heavily inspired Sleep. Tony Iommi is referenced in the lyrics of "Marijuanaut's Theme", and the song "Giza Butler" is a play on the city Giza and the name of Black Sabbath's bassist, Geezer Butler. Also in "Giza Butler", references are made to several things in Frank Herbert's 1965 novel Dune, including the gom jabbar (referred to as the "bong jabbar") and Muad'Dib (as "Muad'Doob"). The band's third album Dopesmoker was previously released as Jerusalem in 1999 by The Music Cartel. Unauthorized by the band, Sleep discredits the validity of its quality and release. ^ "The Sciences by Sleep". Metacritic. Retrieved April 24, 2018. ^ Koczan, JJ. "Saturday Sleep In: "Antarcticans Thawed" Live at ATP 2009". The Obelisk. Retrieved April 22, 2018. ^ Burke, Max. "Sleep: Interview". Prefixmag.com. Retrieved 20 December 2018. ^ "SLEEP Are Working On A New Record". 3 January 2014. ^ "Adult Swim Shows". Adult Swim. ^ "WEEDIAN.COM – The official site of the band SLEEP". Weedian.com. ^ "SLEEP Reveals It's Working With NEUROSIS's Keyboardist Via Morse Code". Metalinjection.net. 12 April 2017. ^ "Sleep Release First New Album in Over a Decade". Pitchfork.com. ^ "Sleep Releases First New Album Since 1998". Third Man Records. Retrieved 12 November 2018. ^ Haver Currin, Grayson. "Sleep: The Sciences Album Review". Pitchfork.com. Retrieved 12 November 2018. ^ Camp, Zoe. "Review: Sleep - 'The Sciences'". Spin. Retrieved 12 November 2018. ^ a b Franklin, Dan. "Sleep – The Sciences". The Quietus. Retrieved January 31, 2019. ^ Sodomsky, Sam. "Sleep – 'Marijuanaut's Theme'". Pitchfork. Retrieved January 31, 2019. Bennett, J. (2009). "High Times: The Making of Sleep's Jerusalem". In Mudrian, Albert (ed.). Precious Metal. Da Capo Press. ISBN 978-0-306-81806-6. Retrieved January 31, 2019. This page was last edited on 23 April 2019, at 14:58 (UTC).